To mark the occasion Land Rover invited more than 700 current and former Solihull employees involved in the production of Series Land Rover and Defender vehicles to see and drive some of the most important vehicles from its history, including the first pre-production ‘Huey’ Series I as well as the last vehicle off the production line, a Defender 90 Heritage Soft Top. 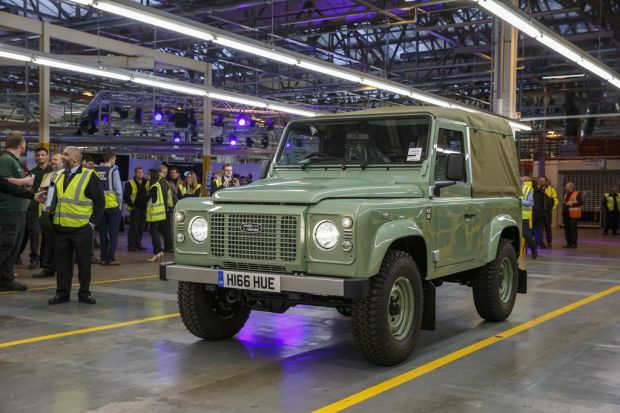 At the same time, Land Rover announced a new Heritage Restoration Programme, which will be based on the site of the existing Solihull production line. A team of experts, including some long serving Defender employees, will oversee the restoration of a number of Series Land Rovers sourced from across the globe. The first vehicles will go on sale in July 2016. The Defender Celebration in Solihull saw more than 25 unique vehicles from Land Rover’s history come together in a procession around the Solihull plant, featuring the final current Defender vehicle off the line. Land Rover associates were joined by a number of previous employees from the past 68 years to help celebrate this historic day. The last of the current Defender vehicles includes an original part that has been used on Soft Top specifications since 1948 – the hood cleat. The vehicle will be housed in the Jaguar Land Rover Collection. Land Rover fans are invited to upload their most memorable journeys ever undertaken in Series Land Rover or Defender vehicles via an upcoming online ‘Defender Journeys’platform, announced today. Effectively a digital scrapbook, Land Rover aims to collate as many exciting adventures as possible into this online map, which users can view and share.